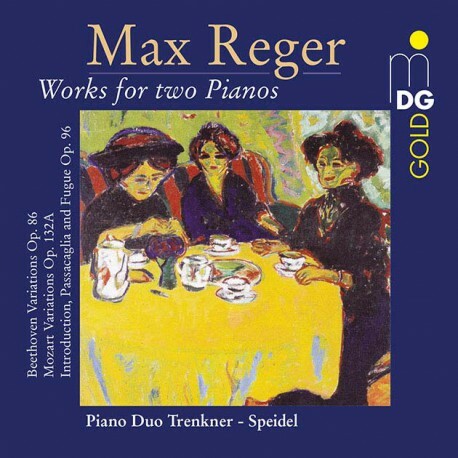 These three pieces represent Reger’s complete music for two pianos. The Mozart Variations (1915), based on the theme from the A-Major Piano Sonata, K 331, are better known in the earlier orchestral version from which Reger made the two piano arrangement. They are representative of his late style, as contrapuntal as ever, but with clearer textures and more open harmonies than in his earlier music, as represented by the other two works here. The Beethoven Variations (1904) are based on the Bagatelle, op. 119/11, and are more involved, although structural clarity is maintained through the clear contrast between each of the short movements. Typically for Reger, each set ends with a large-scale fugue, as does the third work, the Introduction, Passacaglia, and Fugue, op. 96 (1906). This piece is more in the spirit of Reger’s organ music, the counterpoint unfolding in long, flowing lines, here skillfully distributed between the two players. The liner note, by Gabriele Gafäller, tells us that the three works were among the composer’s most popular in his lifetime, a result of their accessible style, and despite the challenges they pose to the performers. The release is a reissue, on the MDG Gold imprint, of a recording made in 1998, presumably now reappearing for the centennial anniversary of the composer’s death. Pianists Evelinde Trenker and Sontraud Speidel give attractive and unfussy performances, not overly dramatic, but with suitable contrast between the variations and excellent clarity for the contrapuntal lines. The liner says of the instrumentation “Steinway D Grand Piano from 1901,” which presumably means two such pianos of the same vintage. Technically, then, these are period instrument performances, a fact most obviously apparent at the registral extremes, with the higher notes sounding a little boxy and the bass somewhat constrained. At least a two other versions of these works are currently available, so the choice of pianos here many be the deciding factor, for or against. But the recordings make an excellent case for the music, which, despite its initial popularity isn’t really from Reger’s top draw, or at least, it lacks the cutting-edge harmonic progressions and adventurous compositional outlook of his most interesting work. Typically for MDG, this reissue is as elegantly packaged and presented as the original. The tracking is curious; each variation set is presented as two tracks, the first with the theme and variations and the second with the fugue, though the scale of both fugues justifies the treatment. A positive notice then, but not an enthusiastic recommendation. I notice that the same duo later went on to record Reger’s arrangements of Bach’s Orchestral Suites, another interesting curiosity, no doubt, that may also be due a reissue.